Naturally sweetened with maple syrup and oil-free, this delicious crunchy granola is versatile and perfect anytime of day! Preheat oven to 300 degrees Fahrenheit. Line large, rimmed baking sheet with parchment paper or a silpat. In a large mixing bowl, combine the oats, almond, cashews, flaxseed meal, coconut flakes, maple syrup, vanilla, optional cinnamon and pinch of salt, mix well to combine. Layer granola mixture on the lined baking sheet, spreading out to the edges, in as evenly distributed as possible. Place baking sheet in the oven, on the middle rack, and cook for 45 minutes, stirring the mixture well every 10 minutes or so. Once done, remove from oven and let cool. When granola has cooled, it will be perfectly crunchy and ready for you to devour! 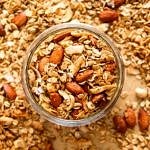 Store granola in an air tight container for up to 3 weeks. It’s great as a cereal with fresh fruit, non-dairy milk or yogurt. Use slivered almonds in place of whole, or rough chop whole almonds if you like. Use whole cashews or halves & pieces. I used large coconut flakes, but shredded coconut works too! This is a loose granola recipe, for a clumpy granola, take a look at this Peanut Butter & Banana Granola Snack Clusters. It’s superb and full of chunky pieces of granola! If you’re not a vanilla lover, omit it, or use a smaller amount – 1 or 2 teaspoons will be great too. If you don’t have flaxseed meal on hand, no worries, it will still be healthy and delicious. If you don’t have any flaxseed meal on hand, no worries, you’ll be fine without it. Add in 1/2 – 1 cup of dried fruit once the granola has been pulled from the oven. A few dried fruits to use are raisins, dried blueberries or cranberries.